Let’s Fly to Space, Carol. 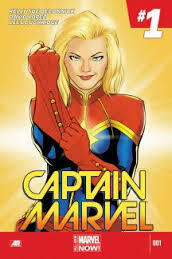 Captain Marvel #1 is exactly what I would want out of a first issue. A straight to the point story with a good enough back story. Captain Carol Danvers (aka Captain Marvel) is leading a rag tag team across the universe in what appears to be a wild goose chase. Or is it? While walking around an alien planet, Marvel and her alien companion Tic are intercepted by Spartax Secret Police. We’re not sure what they are after yet, but Marvel and Tic make a run for it. The back story is a classic “how-did-she-get-here” story, but that doesn’t mean it’s any less interesting. Frankly I’m not familiar with Captain Marvel. I know of Carol Danvers through various social media outlets, and well hanging out in comic shops most of the time. What I do know of her after this issue, is that she is a take charge woman. She’s a caring person who possibly has some ex lover troubles. She also likes Star Wars and punching things. Overall, a gal I’d probably call my friend if she were real. Writer Kelly Sue DeConnick masterfully creates a scenario that even the newest Marvel readers can follow. The dialogue is witty and appropriate for each character. She writes them in a way that even to the newest reader, we can relate to the characters. The art is also impressive. David Lopez has a unique, beautiful style. Carol’s style reminds me of the Golden Age heroines I love and adore, but with a splash of modernism thrown in. What I enjoyed the most from this issue is that Captain Marvel is perfectly capable of fighting by herself. She has super powers. She has a colorful costume. But she’s humble and kind to people and has a sense of duty. She’s also a nerd. Anyone who makes a Star Wars reference before starting a brawl is ok in my book. She recognizes that children look up to her and she acts like a proper role model. Sure her personal life may be messy, but that’s not keeping her from doing the right thing. There’s no reason to not have this in your pull list. It’s an engaging story with enough wit and sass to keep everyone entertained. I enjoyed it, and you will too! This entry was posted on March 21, 2014 at 11:05 am and is filed under General. You can follow any responses to this entry through the RSS 2.0 feed. You can leave a response, or trackback from your own site.